I don’t plan to write blog posts for every single item I explore during this research project, but this one seems to lend itself well as a teaching tool. Working with oral history is a slippery slope, so I will be sharing some concerns and techniques. Mr. Putnam married Lillian Waterman in 1906 and they had four sons; Donald, Bernard, Kenneth and Milton. Lillian can remember as a child, when she lived on the Waterman Road, that there was an Indian encampment on the hill in back of her home. Those Indians were friendly, however, and they used to make and peddle baskets. A man by the name of Kan-is-ta-naux, a full-blooded Indian, built a house on what is now the corner of Route #380 and the Munger Road. The whole yard was fenced in an many flowers and herbs adorned the yard. His daughter Net-to-let-to Kan-is-ta-naux was an herb doctor. At first glance this may not seem like much, but oral history like this can be chock full of good stuff. Oral history can be the “breakdown brick walls” kind of good stuff. But a researcher must always ask if the information is trustworthy. All too often the answer is no, but when the answer is yes, the benefits can be sweet. Is it Reliable? This question should be asked of any quaint story found in print or conversation. Newspapers, local history books, and published genealogies seem to have an endless supply of stories about our ancestors and even more on the topic of local Indians. All too often these stories are very loosely based on something that may have happened, but an elaborate web of vagueness, exaggeration, mis-interpretation, mis-remembrance, mis-understanding, cultural differences, personal preferences, and sometimes outright fraud has woven an entirely new creature that bears little resemblance to the truth of the matter. For other researcher’s opinions and concerns about oral history, you may want to visit these informative blog posts. So how does one go about determining if oral history is trustworthy? We must research the story looking for evidence that confirms and/or refutes the various elements of the story. Building a timeline of the people, places, and events mentioned in a story is a great way to determine if a story has any merit. If a timeline shows John was born 10 years after the great battle he participated in then I know I have a problem. This element of the story is not believable, but other elements of the story may be valid. Perhaps the details of the battle are valid but the wrong person is cast as the hero. Perhaps it is John Sr. who participated in the battle or John’s uncle, whose name is also John. Or perhaps no one in the family participated and someone was ashamed of it so made up a story to make descendants feel good. A hard thing for many people to accept is that Grammy may not have remembered all the details correctly or she may not have wanted anyone to know the truth. People do forget and people do lie, even our beloved grandparents! As researchers, we can not just accept what we are told by others, we must try to validate it. If we can not validate it, we must discount it as hearsay and be very careful not to use the information as if it was fact. I will use this story printed in a local history book to demonstrate my analysis process. This story contains lots of good information to work with. I am not always this fortunate. Some stories are just too brief or too vague to evaluate. I start by taking the story apart. Make a list of all the specific things mentioned, paying special attention to names, dates, places, and historical events that can be placed on a timeline or used to gather more information about elements of the story. There was a hill behind her home. I need to establish if the person telling the story could know the information first hand or if they must be repeating something they were told by someone else. I have one date to work with along with the name of the woman telling the story. I also know the name of her husband and children. 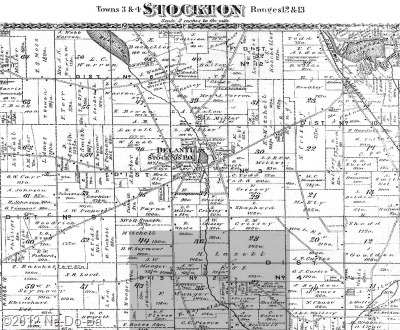 Armed with this information I am able to find the family in census records A little more research identifies Lillian Waterman as born 5-Dec-1887 in Stockton daughter of Clement Waterman and died in San Diego on 5-Jul-1950. I begin my timeline with the person telling the story and the publication date of the book it appears in. I was not able to learn much about the book’s author, so I don’t know how old she was when Lillian died or if the two women could have ever known each other. There is a gap of 37 years between Lillian’s death and the publication of the book. I must assume that someone interviewed Lillian before her death and wrote it down for a historian to use decades later or perhaps the story was oral and repeated to the historian by a 2nd (or perhaps even 3rd or 4th) party. This gap certainly suggests the details of the story could be a bit fuzzy. Already I can show there is room for errors to creep into the original telling of the story. Of course, this does not mean the story has errors, only that errors could have occurred during transcriptions and re-tellings. If the story was extremely important to me, I would spend more time learning about the book author and perhaps tracking down the woman or her research notes if she is no longer living. I could also learn more about Lillian and try to contact descendants to see if anyone knows how the story was preserved. So, now my next question is – can I place Lillian in a position to actually know this information personally? I also need to determine what time frame she could have observed the things she tells us about. This may also help me determine the merit of the story. Back to my research of Lillian. I discover Lillian in the 1892 NY State census as a five year old living with her father in another town. But I keep going and find her in the 1900 census as a twelve year old living with her grandparents, Allen & Ruth Waterman in Stockton. The census taker neglected his duty and did not record the street name in the 1880, 1900, and 1910 census. Things look promising. I can place Lillian in Stockton as a child. How can I find out where she actually lived in Stockton? Back to research. If a directory for the town is available I can check there, but no luck finding a directory. I search Google Maps to find the roads mentioned: Rt. 380, Munger Road., and Waterman Road. Now I know where these roads are and I search for older maps. I find a USGS map from 1900 showing a good size hill along side the Waterman Road. I find another map dated 1881 with the names of land owners. I know from census records that Allen Waterman is in Stockton at this time as a young farmer. So I search for Waterman and Kanistanaux where I think I might find them. Sure enough there they are on the 1881 map not far from each other (see the second map below). Now I know the location of the Waterman farm and looking back at the topographical map I see that hill is right behind the house just like Lillian tells us. Chautauqua County 1881 – F.W. Beers and Co. The Kanistanaux homestead is on the corner of Route 380 (vertical) and the Munger Road (horizontal) south of Stockton village. Of course it wasn’t called Route 380 in 1881 but it was when Lillian was an adult. 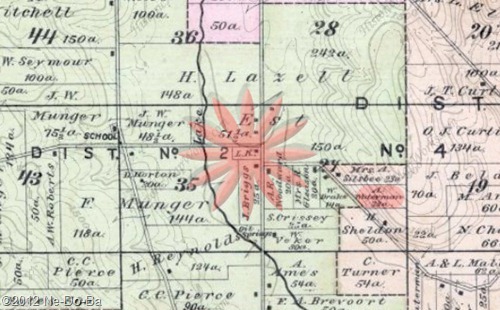 The exact location of their property is identified by the initials “L.K.” in the center of the red flower and the Waterman’s are to the right where you see a small red oval on the map above. The Kanistanaux lot appears to be about 10 acres. A news clipping from 1874 suggests the family originally purchased 100 acres. It will be important to find land deeds to determine if they sold off land between 1874 and 1881 or if the newspaper added a zero to the acreage by mistake. So, I can place Lillian at the right age and in the right place to actually know what she is talking about. The time period she remembers would be sometime after the 1892 NY State census taker visited and before 1906 when she married. It is probably earlier than 1906, but how much so is hard to say. At what age does a person stop thinking of themselves as a child? Perhaps 13 or 14, perhaps older, but probably not younger. Now I add some key data for the Kanistanaux family to my timeline to see if any inconsistencies show up. Nothing appears to be out of place. Based on my research, Lillian should have known the neighboring Kanistanaux family. However, census residences suggest Lillian may not have known Lee-o-netto personally. Now I want to review my original list to see how I am doing. His daughter’s name was Net-to-let-to – ? His daughter was an herb doctor – ? So far, Lillian’s story proves out well. If I arrive at this point and have DISPROVED elements, I need to be real cautious about how I use any element I can not clearly prove. The last two items on my list are a bit sticky. My research to-date suggests Laton was not the father of the Kanistanaux children. In fact he was only 11 when Lee-o-netto was born. However, my research to-date has shown that Laton was head of the household containing Kanistanaux children and was referred to as father by Carrie. I also know that Lee-o-netto is referred to as a sister to Carrie and Henry. It seems perfectly reasonable for a neighboring child to believe Lee-o-netto was a daughter. So, the statement is technically wrong but there is a good explanation for the error. Lillian probably has good reason to believe this is true so I don’t mark this against her. But it does present me with a problem. What do I do with this element? It is still useful, because it provides me with insight on how the neighbors view the Kanistanaux family unit. Lillian sees a traditional family with parents and children that include Lee-o-netto. I have already researched Lee-o-netto and know she is indeed an herb doctor. This last element is proved as long as I accept the explanation for calling her a daughter. Now I have to deal with the spelling of the names, Kan-is-ta-naux and Net-to-let-to as found in this history book. The only place I have seen Kanistanaux with hyphens is in this specific book. The book contains a brief biography of the family where the name is also hyphenated. To date I have never found it in original documents with hyphens, suggesting the hyphens were possibly added by Lillian or one of the folks between her and the author of the book. This element of the story is highly questionable, so I will not start adding hyphens anytime soon. Hyphens often mess up search engine results so I will not use hyphens in future searches. However, if this was just a spelling issue with no hyphens involved, I would add it to my list of spelling variations to check when searching. What’s up with the name Net-to-let-to? In my research of Lee-o-netto I have found reporters and newspapers butchering the spelling, but I don’t recall this version. In all business related advertising controlled by Lee-o-netto herself the spelling and hyphenation is always very consistent. There is no doubt in my mind Lee-o-netto is the way this woman chose to spell her professional name. My research also shows she was often referred to as Nettie by family members. Because the name is unusual and Lillian may have heard her referred to in different ways, I can see how it might be remembered incorrectly. I will not hold this against Lillian, but I also will not accept it as valid. Lillian appears to be a reliable witness, but a couple of details are a bit weak. There are two elements of the story left to evaluate. Lillian tells us “The whole yard was fenced in an many flowers and herbs adorned the yard.” I am not likely to ever be able to prove or disprove this because of it’s nature, but I am now in a position to properly evaluate it. Going back to my maps, I can see that folks on Waterman Road traveled right past the Kanistanaux homestead on their way to town. The roads in this area have not changed much today, so this should be true for any time period. Schools and churches perhaps took Lillian past the homestead as well. A colorful yard is very likely to attract the attention of a young person and be remembered later in life. It seems very reasonable to believe the homestead of a family of herbal doctors is adorned with herbs and flowers. I believe this element is valid and should be identified as oral history from a “seemingly reliable witness”. My research has shown several members of the Kanistanaux family group were known as Indian doctors. I have always wondered where they acquired the herbs they used. This simple little story provides a possible answer to the question. Is it a fact they supplied herbs to Indian doctors? No, it is a theory and should always be stated as such until I find additional evidence. I wonder if a Botanist would find medicinal herbs still growing on the property today? Sounds like an interesting summer project for descendants. Perhaps we really could prove this element if we worked at it some more. The final element relates to Indian basket makers camping on the hill behind the Waterman home. My research has established the time period to be between 1892 and 1905. My prior knowledge of this subject will be useful here. I know traveling bands of Native basket makers are a common thing in this time period. I also know basket makers peddle their baskets where ever they set up camp and even on the road while traveling. I see nothing out of place with this part of the story. However, Lillian does not connect the basket makers to the Kanistanaux family, so I can not make any assumptions about the identity of those basket makers without further research. I can use this element of the story to search for additional information in local newspapers. Perhaps these basket makers are relatives of the Kanistanaux and camping nearby while visiting. Perhaps in researching them further I will find something important to my project. Without the clues provided by this oral history, I may not even think to look for a band of basket makers and if I did wonder about the possibility, I would not know where to begin my search. It would be like looking for a needle in a haystack. But now I have shown I have a reasonably reliable witness providing me with a specific location and a specific window of time. A much more do-able project! This little story has provided me not with specific facts about the Kanistanaux family but with glimpses into the possible personality of the family and with ideas of where to look for other possible clues of value to the project. All in all, I feel this is a reasonably reliable witness and a very useful but not perfect story. Lillian Waterman Putnam is a reasonably reliable witness to the elements in her story. Lillian Waterman Putnam shared childhood memories of living on the Waterman Road between 1892 and 1905. Lillian remembered Indian basket makers encamped on a hill behind her house peddling baskets. Lillian remembered her neighbor as an Indian named Kanistanaux with a house on a nearby corner described by her as “fenced in an many flowers and herbs adorned the yard”. Lillian remembered Dr. Lee-o-netto as a herbal doctor and recognized her as a member of the Kanistanaux family. There are many other techniques, tips, and tools that could be mentioned in this post. So many that it might never end. So, I am ending it now with this final review. Each story we encounter as researchers will be different, but the basic process should be similar. If any of my readers have an old Indian story they need help analyzing, I would be glad to add my 2 cents, just don’t expect me to do all the work for you.